Truism or not, most of us want to be successful in the company or organization that hires us. And, so does, in fact, the company or organization in question. This is why company recruiters have been tinkering with the process of evaluating job applicants — they want to predict the chance of a candidate’s future success. A resume or curriculum vitae — if structured properly — will help identify whether the skills and experience of a candidate fit the requirements for the job. Candidate interviews then typically follow to confirm whether a person is who he or she says he or she is and whether he or she could be “one of us”. Unfortunately, as recent literature suggests, interviews often fail to predict the success of candidates. They may not even reveal the “real person”. What’s more, interviewers tend have a positive bias towards candidates that are similar to them. But, does a company really need such a candidate? To minimize the effect of such perceptual bloopers and achieve a more objective candidate selection process, company recruiters are increasingly relying on a host of selection methodologies. The following is but a brief analysis of the most pertinent ones being used today. Without pretending to be complete, candidate tests broadly revolve around tests that plot a candidate’s intellectual abilities (IQ), his or her emotional bandwidth (e.g. EQ), and his or her personality (e.g. MBTI). The latter two are seen as “soft skills” probably because they are hard to grasp. These days, of course, you also have AI or algorithm-based candidate selection, a statistical approach. One of the most-used IQ tests today is named after the Romanian-American psychologist, David Wechsler, who developed its first version in 1939. Wechsler’s IQ test evaluates both the verbal and non-verbal (or performance-related) abilities of a person. An overall IQ score typically lies somewhere between 55 on the low end and 145 on the high end, most people scoring close to an IQ of 100. Make no mistake, there are at least 10 other popular IQ tests, each typically named after the psychologist who devised or invented it. Most of these versions can be traced back to a test developed in 1905 by the French psychologist, Alfred Binet, who designed it to rate the verbal abilities of children. In 1916, the American psychologist, Lewis Terman, at Stanford University, revised Binet’s IQ scale and turned into the then popular “Stanford-Binet scale”. Since the early 1900s, IQ-test versions have mushroomed as psychologists added new ways of rating our intellectual abilities based on their particular interpretation of human intelligence. By now, thousands and thousands of people have completed these tests and this, frankly, is where their value lies. The value of IQ tests is in the “bell-shaped” distribution curve that they helped produce rather than in the decades-old interpretations behind them. The bell-shaped curve makes it possible to measure people in relation to one another and select those that score better than the majority. The latter might hint at their chance of success. Of course, important questions remain unanswered. Will a candidate use his or her intellect without ruffling the feathers of colleagues and superiors? Will he or she be motivated to apply his or her intellect, skills, and experience to the benefit of his or her environment and company? The American clinical psychologist, Michael Beldoch, did probably not realize what he would bring about in an article published in 1964 on “the expression of emotional meaning”, in which he coined the term “Emotional Intelligence”. In the decades that followed, it triggered a string of publications on “EI”. In 1983, Howard Gardner, a developmental psychologist at Harvard University, conceived the theory of “multiple intelligences”, claiming that an IQ rating by itself is not sufficient to explain someone’s cognitive abilities. From then on, it took another 7 years before the first workable EI-rating models hit the market. An early example, published in 1990, was again named after its originators. The “Mayer, Salovey, Caruso Emotional Intelligence Test” or MSCEIT rates someone’s ability to understand and manage emotions. Unlike IQ tests, it involves open answers and hinges on their overlap with those of a large sample of respondents. A best-seller by the American science journalist, Daniel Goleman, published in 1995 and titled Emotional Intelligence — Why can it matter more than IQ was seen as a breakthrough. Goleman, particularly focusing on leadership, offered a model that rates emotional abilities as well as emotional self-awareness. Like IQ-rating versions, EI-rating versions mushroomed as psychologists added new ways of measuring our emotional abilities until being cut short by statistics that, ruthless as ever, revealed basic flaws. Apart from unsubstantiated assumptions about what intelligence means, EI ratings simply appear to show “little predictive value”. Moreover, an EI rating that hinges on “overlaps” tends to show “conformity” rather than someone’s emotional abilities. Regardless of Goleman’s claim that EI represents 67% of the abilities of outstanding leaders, the effect of EI on leadership and management performance could also not be validated statistically. At one time being criticized as “pop psychology” from within the community of psychologists, “EQ” tests, to recruiters, may contribute through the bell-curve that they helped produce. More aware of the emotional dimension, recruiters can now select candidates based on whether they fit within a certain bandwidth. Catherine Cook Briggs had an observant eye for personalities. For example, she noticed how her future son-in-law differed from other family members. Reading her way through many a biography in the early 1900s, a typology of four “temperaments” ‘dawned on’ her just about when a book by Carl Jung appeared in English. Carl Jung, a Swiss psychiatrist who is acclaimed for founding analytical psychology, had identified what he called “psychological types”. The way Jung’s psychological types resonated with Briggs’ typology motivated her to dig into Jung’s work and publish two papers explaining it, one in 1926 and one 1928. In view of popular personality tests today, as I’ll explain below, it is worth mentioning that her first paper was titled Meet yourself in the personality paintbox. Briggs was soon joined in her exploration by her daughter, Isabel Briggs Myers. Both had not been educated as psychologists and were self-taught in psychometrics. Yet, flair is what distinguished Briggs and Myers. Myers first hooked up with a personnel manager, Edward Hay, who would later establish the “Hay Group”. Hay introduced her to scoring techniques. In 1944, after helping women find war-time jobs, the team published the Briggs-Myers Type Indicator Handbook. In 1962, under the wings of the US Educational Testing Services, Myers finally published the Myers Briggs Type Indicator or MBTI manual. After the death of Myers in 1980, the co-founder of her business, Mary McCaulley, an American psychologist, introduced formal training and computer-scoring programs. By now, the MBTI test has created a loyal and well-organized following of supporters. Its popularity also encouraged others to develop derivative personality tests, again based on, if not safely referring to, Jung’s “psychological types”. Some even expand on Briggs’ reference to “personality paintbox” by using a “language of colors” to explore one’s personality. Increasingly introduced as motivational tool only, the MBTI also fails to be supported by statistics that show its validity. As one researcher wrote: “personality psychologists regard it as little more than an elaborate Chinese fortune cookie.” Jung’s typologies nor the objectivity of the MBTI, its utility, etc. could, in fact, be substantiated. Despite these statistical validity issues, the value of personality tests, to recruiters, may again lie in the thousands of tests that eventually produced bell-shaped curves of personality-type distributions. The latter help select, if not distinguish, candidates based on whether they fit within a ‘desired’ personality bandwidth. Gaining in popularity, algorithm-based procedures involve the selection of candidates based on a computer-driven analysis of, say, the written material provided, typically a CV and application letter. This selection process involves the automated search for phrases and words that have been shown to indicate a certain skill level. Because, ‘mathematics’ is involved, it comes with the promise of doing away with human bias. Still acknowledged as a way to distinguish the wheat from the chaff when having to deal with a great number of candidates, serious doubts have risen about its effect. For one, Amazon, one of the world’s epicenters of AI development, has ditched algorithm-based candidate selection. Rather than preventing bias, Amazon learned, it actually reenforced it. Not only did it lead to gender-bias and, even, plain discrimination, it also narrowed the choice of candidates to a profile that might not benefit a company that is also in need of out-of-the-box thinkers. As is often the case when it comes to computer-based procedures, “garbage or bias in” means “garbage or bias out”. A selection process, in other words, is as good as the data that is used to fine-tune the algorithms involved. All in all, AI-based candidate selection has so far failed to respond to one vital question: Which candidate profile does a company really need, now? The above brief suggests that corporate recruiters may use these candidate selection tests to avoid hiring mistakes particularly by making their recommendations more conceivable. Yet, they probably know full well that EQ ratings and the MBTI statistically fail to predict the future success of a candidate. They now also have reason to doubt algorithm-based selection because it might not identify the kind of profiles a company needs free of bias. In view of this all, it may not be surprising that the overall failure rate of new-hires today is just 46%. When it comes to management new-hires, it is slightly worse: 50% on average does not live up to the expectations within 18 months. An 80% failure rate of higher management new-hires is plainly astonishing, even embarrassing. As you can imagine, the costs of these high failure rates may run into many thousands of US dollars or Euros. These include tangible costs, such as hiring costs and sign-on bonuses, and intangible costs, such as time wasted, negative effect on the broader organization, that is, on its operations, suppliers and, even, customers. So, what might explain these exceptionally high failure rates? The candidate selection tests discussed so far only measure in how far the traits of a candidate match those of other people, a control group, in other words. So, these tests fail to address the actual fit between company and candidate. And logically so, you might think. You cannot compare apples with pears, right? Or, can you? The issue at stake is just that: metaphorically, the aim of a hiring process is to identify “when a bee fits the flower”. But, how do you relate two such different shapes of reality — company and candidate — so as to establish that they reinforce one another? A new way of establishing the fit between company and candidate is to identify the challenges and needs of a company as it emerges and, then, to see how a candidate is naturally inclined or orientated to support this. Metaphorically speaking again, a bee is not always what a flower needs when it develops. Initially, its growth hinges on seed, on pip potential, so to speak. Secondly, when the buds grow, it needs the protection of a ladybug so its early growth is not killed off by lice. Only when it blossoms, a flower needs bees to pollinate it so it can spread through offspring. Then, in the end, fungi are needed to putrefy the flower and turn it into fresh soil, from which pip potential might trigger another cycle of flower growth. This is alright and dandy but on exactly what grounds does one compare company and candidates? you may ask. The approach that makes this possible is inspired by the natural sciences, particularly the laws of thermodynamics, which are at the heart of self-assembly or self-organization. The leitmotif of this approach is that companies, like other phenomena of reality, are shaped by repeated patterns of behavior, that is, in the case of companies, those of people in different roles. These patterns or, as I came to call them, “choreographies” bring about all that we associate with a company and its success, anything from organization charts and processes to products, revenues, and profits. However much we might like to, repeated patterns of behavior cannot just be switched on. They grow over time enticed by a vibrant crucible of external and internal company conditions, I mean, the evolving market and organizational conditions. The latter, by the way, include such matters as goals, strategies, tactics, rewards, and corporate culture. Inside the crucible of company conditions, the least-resistant patterns of behavior typically survive, that is, patterns that follow the least-action paths in view of the local conditions — a thermodynamic principle. This is not different from other realities that, visible to us, are shaped by some form of organization. The V-formation of a flock of migrating geese, for example, is also shaped by least-resistant patterns of behavior. As geese jockey to fly in the slipstream of a peer in front, they get onto their path of least action. In much the same way, companies are shaped by employees that work in the slipstream of leaders and peers. When the external conditions evolve so will the least-resistant patterns of behavior that shape a company. As you can imagine, these patterns will, in turn, shape the internal conditions. So, whereas the emergence of a company can be explained by the growth rate of least-resistant patterns of behavior, its needs during a certain stage can actually be measured through the growth conditions that they produce. These conditions unfold in 4 stages, not unlike those of a flower, and hint at the need for a pip, ladybug, bee, or fungus, as it were. In all, to measure the fit between company and candidate, two assessments are needed: one that signifies the growth stage of the company and one that shows the stage-orientation of a candidate. 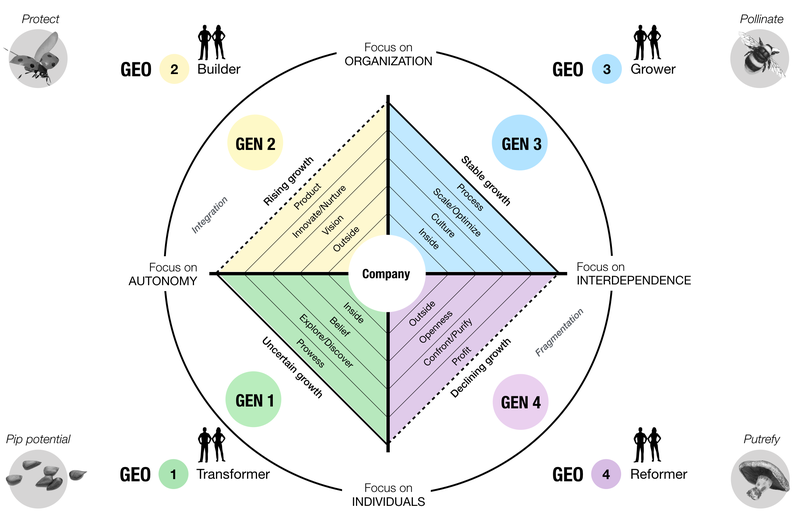 The GEN rating defines the Growth Environment of a company. It is a number that identifies a stage with its particular internal growth conditions. The Growth-Environment Orientation of a candidate, that is, his or her GEO rating, is the number of the stage that resonates most with the candidate’s thinking and acting, especially when push comes to shove. A candidate ideally fits a company when his or her GEO rating matches the company’s GEN rating. After decades of tracing the consistency of evolving growth-environment conditions, we developed GEN and GEO questionnaires so as to standardize the GEN/GEO assessment process — you can get access to them here. The following diagram illustrates the flower metaphor relative to the GEO rating of candidates and the GEN rating of a company. The descriptions of the conditions in each stage explain what the GEN-rating numbers stand for. The labels Transformer, Builder, Grower, and Reformer indicate the typical role or mindset of a candidate with a certain GEO rating number. Further on, you’ll find the so-called GEN/GEO matrix with a detailed characterization of a candidate’s behavior in each GEN stage. It is a crucial tool not just when hiring people but also when optimizing management teams. 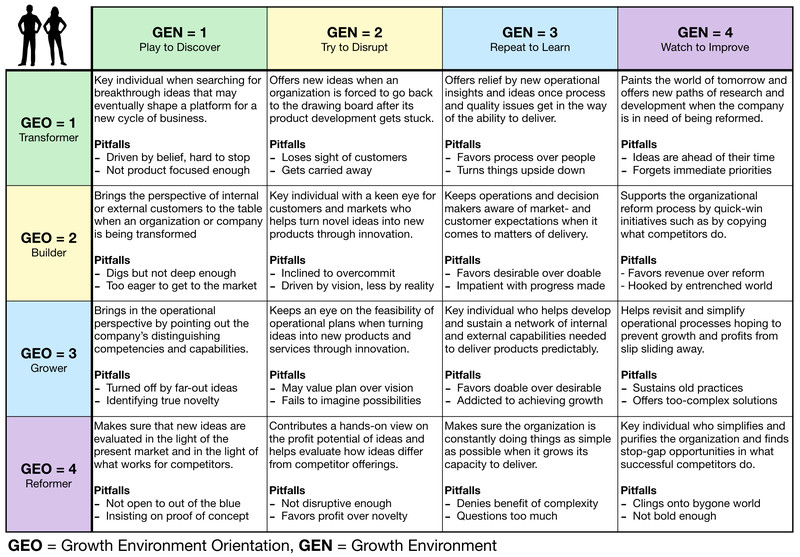 A company’s or organization’s GEN rating is bound to progress from one stage to the next as it evolves. GEO ratings, on the other hand, show to be consistent in that the predominant orientation of candidates, that is, their GEO-rating number, remains unchanged. Training and coaching can, of course, help candidates broaden and deepen their understanding of other GEN stages. However, so far, candidates appeared to be incapable of changing their GEO rating. This may be a matter of a deep-down “division of labor” involving the process of nature, something that I address elsewhere. The above GEN/GEO matrix explains the contribution and pitfalls of a candidate with a particular GEO rating in each GEN stage. Make no mistake, you should not even try to make up your team with people that only fit the present GEO stage of your company. What would you do when your company progresses to the next stage? Instead, you should ensure that the GEO ratings of a management team as a whole are broadly in line with the GEN stage of the company. You achieve this simply by refining the mix of people — some out, others with another GEO rating in. This sounds harsh but it generally works out to be a relief for people who feel they are no longer understood after the company has changed. Then again, do not forget that team members with another GEO rating may well play a vital role in keeping the team focused, alert, and with two feet on the ground. For one thing, whereas your company may be in one stage, its divisions, businesses, and departments may be in another. To conclude, the use of GEN/GEO ratings is not limited to the hiring process. The GEN/GEO matrix can also be used to improve both the organizational conditions and the mix of management-team members. If you feel happy using IQ, EQ, and personality tests then you should continue using them. They do give you a “sense” of control. But, don’t kid yourself: statistically, they do not guarantee a candidate’s success. They just help you do a preselection. Yes, continue using AI-based selection if your HR department gets more applications than it can manage. However, once you know whether candidates have the required experience and skillset, use the GEN/GEO rating process to ensure that they are on the right wave length. Do they really resonate with the challenges that your company or organization is facing right now? As a matter of fact, do you?